Through two U.S. Government Small Business Innovation and Research (SBIR) contracts, Pointwise, Inc. has embarked on a multi-year effort to include a comprehensive set of overset grid assembly (OGA) diagnostic tools into its Pointwise software. Overset meshing and OGA are not new. They have been around almost as long as other meshing techniques; however, due to the ubiquity of unstructured meshing, overset meshing has long hidden in the shadows. Pointwise customers have been using Gridgen and Pointwise to create overset meshes for many years. The purpose of this article is to provide a high level overview of overset meshing and the overset grid assembly (OGA) process, its benefits and why Pointwise is pursuing this area of research. Figure 1: Different mesh types of a 2D cylinder. Left, structured; center, unstructured; right, overset. 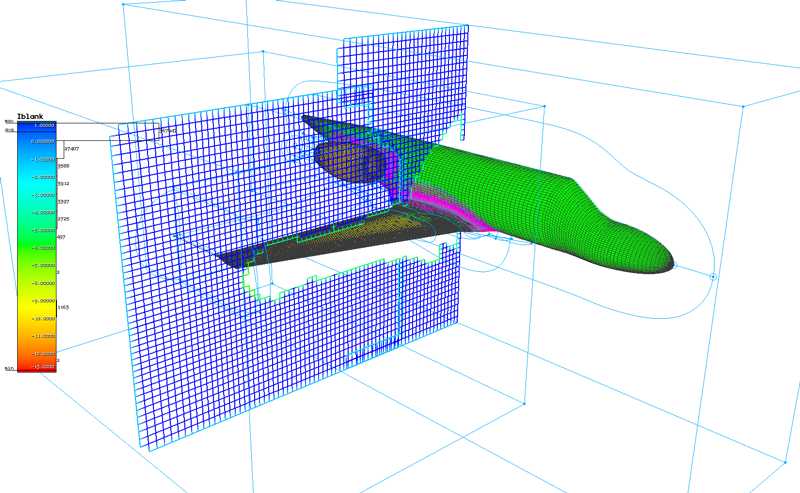 Although computational fluid dynamics (CFD) rapidly has become an indispensable tool in many engineers' repertoires, there are aspects of the process that have prevented even faster growth. Preprocessing regularly is cited as the most time consuming and cumbersome aspect of the CFD process. In recent years, there have been significant advances in CAD data handling and meshing techniques. However, there exists a significant number of applications in which preprocessing advancements are not keeping pace with the demands. For much of the past two decades, unstructured meshing has been the most widely accepted and used approach for meshing complex geometry, but there are aspects of it that are less than desirable. Although unstructured meshes are generally easier to generate than structured, this ease-of-creation comes at some expense. Unstructured meshes tend to pose accuracy challenges for solvers in critical regions such as the boundary layer and typically require significantly more cells than their structured counterparts. Additionally, unstructured meshing generally is not as well suited to moving and/or deforming geometry. Overset meshes and OGA attempt to eliminate these drawbacks. An OGA is a system of non-connected mesh blocks that carry additional information to instruct the CFD solver how to pass solution information from mesh block to mesh block. First, because the mesh blocks, known in the OGA community as component grids, are independent, it is much easier to create the desirable low cell count, high-quality structured meshes. Again, due to the independence of the component grids, overset meshing naturally lends itself to moving and deforming geometries, communicating the solution through the DCI. The component grids can move unhindered relative to each other, only requiring periodic recalculation of the DCI. Recalculation of DCI for small changes in overset grid systems can be done with far less computational expense than deforming and reconnecting unstructured meshes. So, why have overset grid methods not been widely adopted? Although it is much easier to create overset meshes than multi-block connected meshes, it can be a challenge to create the appropriate overlap that facilitates accurate communication among the component grids. In the 1990s, unstructured mesh likely became the dominant method because its cost/benefit was lower than the existing overset methods, and it remains the more popular method today. As such, the CFD community as a whole has relegated overset meshing to where its benefits outweigh the costs, i.e. the high-fidelity provided by structured meshes or complex moving geometry application. Therefore, OGA tools have matured at a slower rate than their unstructured counterparts. Pointwise's research and development effort through the SBIR contracts intends to accelerate the maturation of the OGA process in a couple of key ways. Figure 2: Overset grid assembly of DARPA SUBOFF benchmark case. Inset: Close-up of stern planes OGA. There are two main issues with the current state of the OGA process. First, as the process requires a tool or possibly multiple tools for each step, keeping track of all the necessary files and information can be cumbersome and error-prone. Next, interrogating the quality of the overset mesh system requires the user to visualize the DCI in one tool, remember where the unsatisfactory regions are and attempt to correct them in a another tool (mesh generator). Figure 3: Diagnosing domain connectivity information on an overset grid assembly of a business jet aircraft. Pointwise intends to address the current deficiencies by enabling the user to create the component grids, set up the overset assembly software's input parameters, execute the overset assembly software and interrogate the DCI all from within Pointwise. This approach will significantly streamline the OGA process while closing the interrogation loop. The new OGA process already has been successfully demonstrated in Gridgen during Phase I of the SBIR contract. Phase II of the SBIR contract will incorporate Gridgen's OGA capabilities into our flagship mesher, Pointwise, add support for unstructured overset meshes, and research innovative mesh adaption techniques for optimization of overset interpolation. The project is being headed by Nick Wyman, Pointwise director of applied research, and will include support by Dr. Ralph Noack, a pioneer in the field of overset grid assembly and author of the SUGGAR++ software. For more information about the current and upcoming OGA capabilities in Gridgen and Pointwise, visit our website dedicated to overset meshing and the OGA process www.pointwise.com/overset† or contact us at info@pointwise.com. †[Updated July 2015] The overset web page cited by the article is no longer in use.